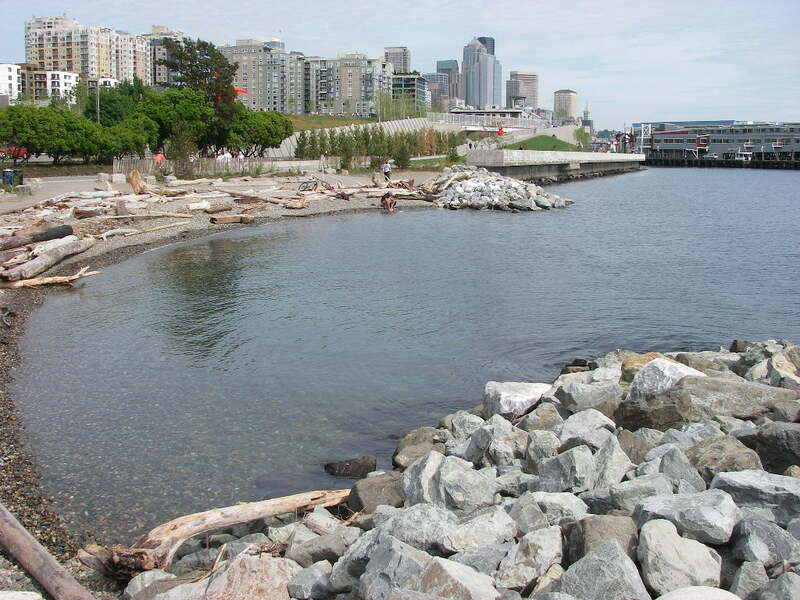 The Olympic Sculpture Park opened in January 2007 and included construction of two shallow-water features: a low-terrace habitat bench placed in front of existing seawall armoring, and a constructed pocket beach that replaced existing riprap armoring. Riparian vegetation was also planted in the uplands replacing impervious surfaces and manicured lawn. It was hoped that these habitat features would help restore some of the lost or impaired functions caused by the armoring. Functions of these habitat features were measured by sampling both before and after enhancements (2005, 2007, and 2009), and comparing to adjacent armored shorelines. Fishes that are dependent on shallow water habitat were a main focus of sampling, specifically outmigrating juvenile salmon (Oncorhynchus spp.) and larvae of other species. Terrestrial and aquatic invertebrates were also assessed, both as a metric for habitat quality and as a determinant of available prey resources for juvenile salmon. Physical features of the created habitats were monitored in post-enhancement years to measure their stability. Nursery area for fish: Nearshore fish used shallow-water enhancements along armored shorelines. More fish (juvenile salmon and larvae of other species, dependent on the year) were observed along enhanced shorelines, often with higher feeding activity. Foraging opportunities: Invertebrates that are prey for juvenile salmon and other fish colonized the low gradient, finer-grained intertidal habitats that were incorporated into the armored shorelines. Most of these aquatic invertebrates increased in taxa richness and numbers with enhancements in place. Riparian value: Some types of terrestrial insects increased in abundance and taxa richness where patches of shoreline vegetation were planted. Vegetation does require routine maintenance in an urban park setting, so progression to a full natural riparian zone will be somewhat limited. Connectivity: Linkages between aquatic and terrestrial zones are broken on heavily armored shorelines. When artificial barriers are removed and aquatic habitats merged with terrestrial habitats, this provides the opportunity for biological and physical processes to reconnect across the ecotone. Physical resilience: In heavily urbanized settings, habitat enhancements have limited ability to change larger scale processes such as sediment supply, and this may lead to the need for maintenance. Human use of urban beaches can create a signal of surface sediment loss such that occasional nourishment may be needed. In addition to the material covered in the manuscript, further information can be found at a website that summarizes all monitoring activities: https://sites.google.com/a/uw.edu/olympic-sculpture-park/home. Jason D. Toft (a), Andrea S. Ogston (b), Sarah M. Heerhartz (a), Jeffery R. Cordell (a), Emilie E. Flemer (b); (a) School of Aquatic and Fishery Sciences, University of Washington, Box 355020, Seattle, WA 98195, USA, (b) School of Oceanography, University of Washington, Box 357940, Seattle, WA 98195, USA.